This document will assist customer for WUG 2017 version and onward. For old or legacy version, ie WUG 2016 or below, refer different document. This document also relevant for customer intent to add a single device without using discovery. When you add devices individually, the device is added to the WhatsUp Gold database immediately doing a discovery scan. The new device is generically categorized as a workstation. This option may be useful for testing purposes, as it allows you to add the same device to a database multiple times. Click Devices > New Device. The Add New Device dialog appears. Type the IP address or host name of the new device. If you want to add a device without scanning for additional device information, select Add device immediately without scanning. The new device is generically categorized as a workstation. If you want to apply a device role to a new device, select Force device role. For more information, see Using Device Roles. Click Advanced to select a number of additional options for which to scan the device. You can select additional options to resolve the device host name, use advanced SNMP and ping timeout and retry settings. Additionally, select SNMP, SSH, WMI or VMware credentials for the new device. For more information, see Setting Advanced single device discovery settings. Click OK to save changes. WhatsUp Gold attempts to resolve the IP address or hostname, then scans that device for device roles (if selected). When the scan is complete, Device Properties dialog appears, allowing you to further configure the device as needed. Note: If WhatsUp Gold already contains the number of devices that your license allows, a message appears telling you that you must upgrade your license or remove existing devices to add a new device. Select the following advanced single device discovery properties to use for the device you are adding to WhatsUp Gold. Resolve host names. Select this option to have WhatsUp Gold attempt to populate the list of discovered devices with host names, instead of IP addresses. If the Use SNMP SysName to name devices option is selected (see below), it is used first to identify device names. If SNMP information is not available, the Resolve host names option is used to identify device names (if the option is selected). Use advanced ping. Select this option to use TCP port checks and ICMP pings to scan on networks. If the TCP connection or ICMP ping is successful, the device at the IP address is discovered. Timeout (ms). Enter the amount of time the scan should wait for the ping or SNMP information in milliseconds (ms). Note: Refer to the information for Use advance ping options, to determine when this setting applies to ping. Retry count. Enter the number of times WhatsUp Gold should attempt to make the ping or SNMP identification. Use SNMP SysName to name devices. Select this option to discover each device name by accessing the device SNMP SysName. This method is used first to identify device names. If not available, the Resolve host names option is used to identify device name (if the option is selected). SNMP credentials. Select the appropriate SNMP credentials. This box is populated from credentials currently available in the WhatsUp Gold Credentials Library. If you select an inappropriate set of credentials, or none is selected, WhatsUp Gold determines device type based on the monitors discovered during the scan. Tip: Click the browse (…) button in the console or the Credentials button in the web interface to open the WhatsUp Gold Credentials Library to configure a new set of credentials to use for discovery. Tip: Credentials are configured in the Credentials Library. When a device is discovered using a credential, that credential is then associated to that device. You can change this on Device Properties > Credentials. If you select All, discovery uses all configured credentials in the Credentials Library. The credential that is successful is then associated with the device. SSH credentials. Select the appropriate SSH credentials. This box is populated from credentials currently available in the WhatsUp Gold Credentials Library. Windows credentials. Select a Windows credential to use when attempting to discover devices where you have to provide a Windows user name or password when connecting. This box is populated from credentials currently available in the WhatsUp Gold Credentials Library. VMware credentials. Select the VMware credential to use when discovering VMware vCenter, ESX and ESXi devices. This box is populated from credentials currently existing in the Credentials Library. Changing the name of a device changes how it appears in the list views. In the Details View or Map View, right-click a device, then click Properties. The Device Properties dialog appears. In the General section of Device Properties, enter the new name in the Display Name box. Type the new IP address in the Address box. From any page where a device is selected using the device picker, click Properties in the title bar. Click General. The General dialog appears. Click Additional Network Interfaces. The Network Interfaces dialog appears. Click Add. The Add Network Interface dialog appears. Enter the network information for the new interface. Click OK to save the new interface information and return to the General section. In the General section of Device Properties, click Additional Network Interfaces. On the Network Interfaces dialog, select the interface you want to make the default. Click OK to return to the General section. In the Device List or Map View, right-click a device, then click Properties. The Device Properties dialog appears. Click Notes. The Notes dialog opens. Enter the note in the Notes box. Use the Notes box to include information about the selected device. 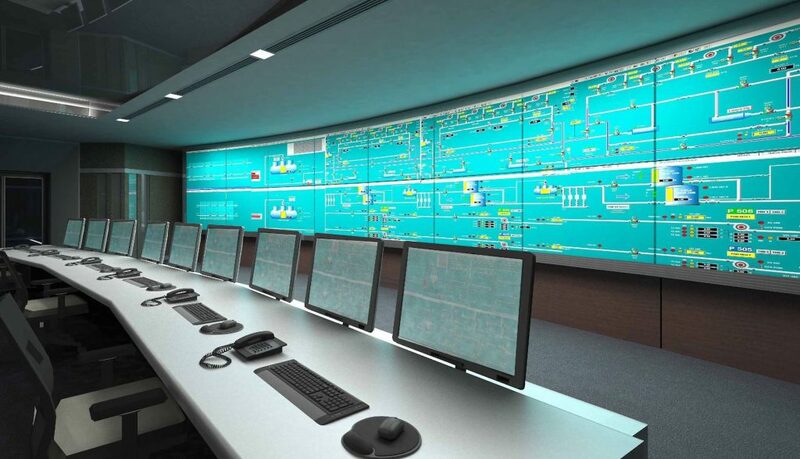 For example, you can record historical information about a device, physical location information, or notes relating to the actions configured for the device. Note: There is no automatic word wrap. Add a return to display information in the dialog without requiring you to scroll to view it. Special remark: If you manual add note over here, if you remove the device, and add back the device, those note will be remove as well, so be careful about that. Important: Prior to the WhatsUp Gold v14 release Device Types were used to identify the role a device performed on the network for the active and passive monitors, menu items, and icons associated with each device. WhatsUp Gold v14 and later has moved Device Type information to be managed in the Discovery Console Device Role Settings. The Device Types dialogs now have limited functionality. Active monitors, passive monitors, and action policies are no longer editable in the Device Type dialog. The device General and Menu Items information is editable. For more information, see Discovering and Viewing Network Data. The device type icons represent network devices on maps. The WhatsUp Gold console provides device types for more than 40 device types with an option to create additional custom types. In either Device View or Map View, select Configure > Device Types. The Device Types Library dialog appears. Click New to configure a new device type. Select a device type, then click Edit to reconfigure the selected device type. 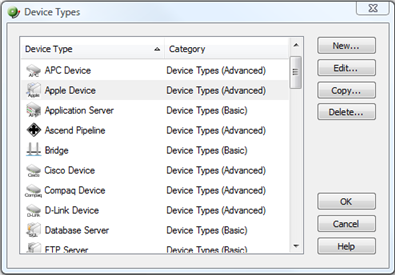 Select a device type, then click Copy to make a duplicate of the selected device type. Select a device type, then click Delete to remove it from the Device Type Library. In Map View, right-click a device. The right-click menu appears. Select a device in the device list, then right-click and select Properties. The Device Properties dialog appears. Click General. The General Properties appear. Select a new Device Type from the list on the right side of the dialog. The device’s type and coinciding icon updates on the map. Use the copy feature to create a shortcut to the device in another group, much like a Windows shortcut. The copy provides access to the original device from a group other than the original group in which it is located. From the WhatsUp Gold web interface, in the Details View or Map View, right-click the device for which you want to copy. The right-click menu appears. Click Copy. The Select a Device Group dialog appears. Select the group that you want to copy the device into, then click OK. The group that you copied the device to opens. Tip: You can also drag-and-drop to copy device(s) from one group to another. Select the device(s) you want to copy, then drag-and-drop to the group where you want the device copied. Use the move feature to move devices to another group. Moving removes devices from the original group and locates them in another group. From the WhatsUp Gold web interface, in the Details View or Map View, right-click the device for which you want to move. The right-click menu appears. Click Move. The Select a Device Group dialog appears. Select the group that you want to move the device into, then click OK. The group that you copied the device to opens. Tip: You can also drag-n-drop to move device(s) from one group to another. Select the device(s) you want to move, then drag-n-drop to the group where you want the device moved. Use the delete device feature to remove devices from WhatsUp Gold. Once removed, the device is not monitored. From the WhatsUp Gold web interface, in the Details View or Map View, right-click the device for which you want to delete. The right-click menu appears. Click Delete. A message appears asking you to confirm that you want to delete the selected device(s). The WhatsUp Gold cloning feature, available in the web interface, allows you to do a deep copy of a device. The term deep copy means that the device is copied to a new device with all active monitors, passive monitors, actions, attributes, etc. applied to the new device. This functionality makes it easy to create a new device with monitors, actions, and attributes set up based on ones you have already taken the time to set up for a previously created device. This reduces the time required to setup new monitors, actions, and attributes for a new device. Note: Any monitors and action policies associated with the device you are cloning from are not duplicated for the new cloned device, rather the new cloned device has the existing monitors and action policies applied to it. There are two ways to clone a device: from the device right-click menu or dragging-and-dropping a device from a device list or a map view to a new device group. After you have cloned a device, you need to change the device host name and address in the Device Properties – General dialog settings so that WhatsUp Gold can monitor the new device and all of the active monitors, passive monitors, actions, and attributes that are applied to the new device. For more information, see Changing the cloned Device Properties. From the WhatsUp Gold web interface, in the Details View or Map View, right-click the device for which you want to clone attributes. The right-click menu appears. Click Clone. The Clone selected items from x to …. dialog appears. Select the group that you want to clone the device into, then click OK. A status dialog appears indicating the cloning process status. Click Close to complete the cloning process. Tip: You can also use the Device Properties – Notes dialog to verify if a device is a cloned device. Right-click the device you want to check, then click Properties > Notes. If the device is a cloned device, a message appears; for example, This device was cloned on 6/24/2010 10:12:37 AM. Change the cloned device properties as required. For more information, see Changing the cloned Device Properties. Click Devices. The device list appears. In either the Details View or Map View, select the device (or multiple devices) for which you want to clone attributes, then drag the device(s) to the device group where you want the device(s) to appear. The Copy, Move, Clone, Cancel menu appears. Click Clone. A status dialog appears indicating the cloning process status. After you have cloned a device, you need to change the device host name and address in the Device Properties – General dialog settings so that WhatsUp Gold can monitor the new device and all of the active monitors, passive monitors, actions, and attributes that are applied to the new device. From the group where the new cloned device resides, right-click the device, then click Properties. The Device Properties dialog appears. Click General. The General dialog opens. Enter the new device Host name, Address, and other information you want to change for this device, then click OK.